It's a bit embarrassing to note that this is my first encounter with the work of Arthur Schnitzler, one of the literary figures whose spirit hangs over the entirety of the 1890-1939 period which most fascinates me. His psychologically astute, sexually frank, and urbanely ironic plays, novels, and short fiction provided one major model for twentieth-century European narrative; pretty much every "sophisticated" filmmaker from Öphuls to Bergman to Kubrick has adapted Schnitzler to one degree or another. Casanova's Homecoming, as the 1922 English translation I read puts the title, is one of his more minor works, a novella concerned primarily with the inner world of the aging lothario; the flashes of womens' (or indeed anyone else's) interiority that give the first half of the book a rather delicate romantic-comedy tint are gradually snuffed out by the ruthless egotism of the central character -- the historical Casanova -- as he concerns himself more with logistics than with personalities in the pursuit of his appetites. The turning point, where he unveils himself as not merely a charming rogue but a pointlessly destructive monster is, in more senses than one, Nabokovian; the delicacy of Schnitzler's prose (even in a rather pompous, old-world translation) and the closing-in of viewpoints could easily read as narrative justification to an unwary reader. Briefly, in the first few chapters, I thought of relating this book to the trend of historical romance which was immensely popular in the period: books by Arthur Quiller-Couch, Agnes & Egerton Castle, Jeffrey Farnol, Maurice Hewlett, and (soon) Georgette Heyer were busily domesticating the seventeenth, eighteenth and early nineteenth centuries into family-friendly swashbuckling, with female characters who owed more to current actress personalities than to the historical record; but Schnitzler is playing an entirely different game. His freethinking polymath Marcolina, though not a historical personage, is also not a romantic heroine, but a nearly tragic figure. 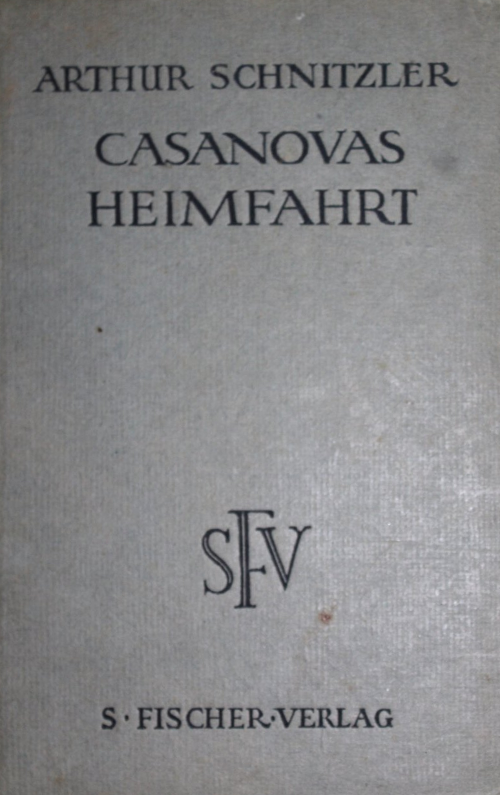 The "gay adventurer" which the romancers would make of Casanova becomes ashes in the mouth thanks to Schnitzler's pitiless psychological acuteness.